How do you use your feet? 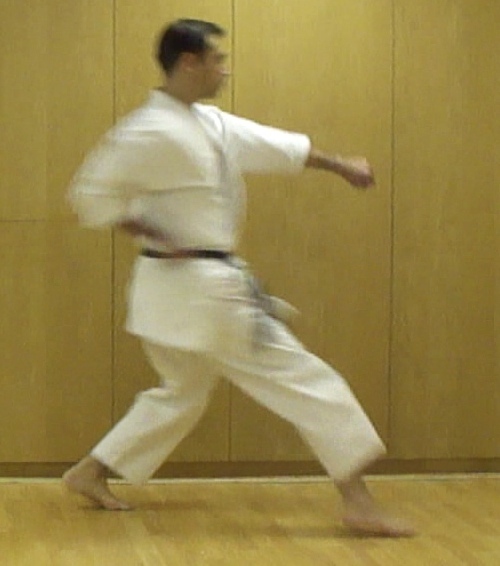 A few weeks back I was reading an excellent blog post on ‘Old School Karate’ by Garry Parker of Columbus Dojo. 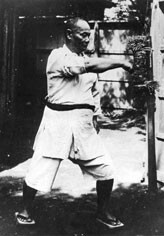 He’d made a personal list of the things he did that he considered as facets of ‘old school’ karate. Obviously such a list is very personal: you can ask one hundred excellent and experienced karateka to list ten things and I imagine that while you’ll get a number of answers that crop up again and again, you won’t get one hundred identical answers, and it might be arrogant to say that any one of those answers was ‘wrong’. One thing that was mentioned in his article (which you can read here) was the importance of learning to use the feet in karate. How we use the feet has immense importance for not only the feet themselves, but also affects how efficiently and effectively we use the ankles, calves, thighs, hips, pelvis… you get the idea. 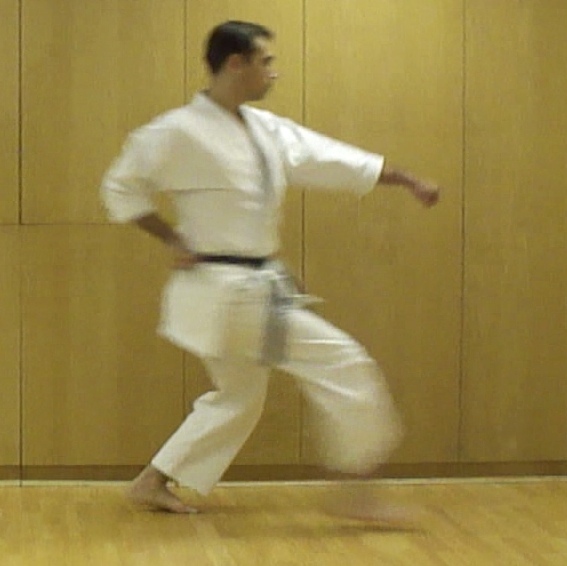 If the feet aren’t being used correctly then your ability to move, hold position, apply or receive power effectively is compromised, and so is your karate. I train in two karate systems, one of which trains barefoot and one that wears footwear. As such I am very aware of the differences and similarities between the two approaches. Whether you train barefoot or in footwear it is important to recognise that they do create different dynamics. As an example here are two video captures of me stepping at speed barefoot and in trainers. 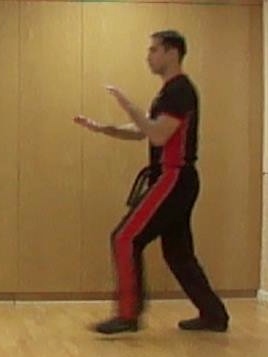 In both the stepping foot hovers just above the ground as I step, but (without my being consciously aware of it) in trainers my heel automatically touches the ground first (just as it does in normal walking), a different movement to the flatter ‘ball first’ barefoot landing, even though in both my toes are slightly raised and then grip on landing. 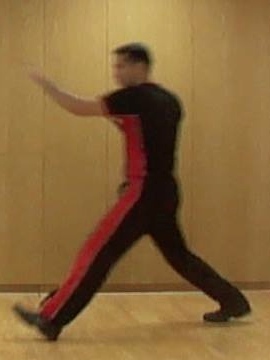 While the actions of the supporting foot may be almost identical in both, often the stepping or kicking foot has a different ‘feel’ or position in footwear. Personally I think it’s important to be aware of the dynamics of each if you are possibly thinking that you might need to use your karate in footwear. The positioning and ‘working’ of the feet is obvious when you are barefoot (if you know what to look for or if it is being highlighted by the teacher). What is less obvious is that the same things you do when barefoot are equally important to use the feet effectively when you are in footwear. How the foot is moved and grips within the shoe, just as when barefoot, has a knock on effect on the rest of your biomechanics. In fact I would argue that although hidden, correct use of the foot is even more important when shod than barefoot because of the sole between the foot and the ground. Even in heavy trainers I am always aware of the type of surface I am on (I can feel it through the shoe), and my feet are always relaxing and tensing in different ways to allow purchase or mobility. As to which is old school? Using the feet properly is old school. Whether you do so barefoot or shod depends on location, preference, and practicality. There’s a lot of detail in the feet. Whether you are barefoot or wearing footwear to train, those details should not be neglected. If you want to get a grip on your training, get a grip on your feet.